Rabies is an acute viral disease of the central nervous system that is transmitted through saliva from the bite of an infected animal. Rabies affects humans and other mammals but is most common in carnivores (flesh eaters). It is sometimes referred to as a zoonosis, or disease of animals that can be communicated to humans. Rabies is almost exclusively transmitted through saliva from the bite of an infected animal. Another name for the disease is hydrophobia, which literally means fear of water, a symptom shared by half of all people infected with rabies. Other symptoms include fever , depression, confusion, painful muscle spasms , sensitivity to touch, loud noise, and light, extreme thirst, painful swallowing, excessive salivation, and loss of muscle tone. If rabies is not prevented by immunization, it is almost always fatal. Rapid evolution of the rabies virus. Bats in the United States have developed a particularly infectious form of the virus. Increased diversity of animal hosts for the disease. Changes in the environment that are bringing people and domestic pets into closer contact with infected wildlife. Increased movement of people and animals across international borders. In one case, a man who had contracted rabies in the Philippines was not diagnosed until he began to feel ill in the United Kingdom. Lack of advocacy about rabies. Cases of rabies in humans are very infrequent in the United States, averaging one or two a year (down from over 100 cases annually in 1900), but the worldwide incidence is estimated to be between 30,000 and 50,000 cases each year. These figures are based on data collected by the World Health Organization (WHO) in 1997 and updated in 2002. Rabies is most common in developing countries in Africa, Latin America, and Asia, particularly India. Dog bites are the major origin of infection for humans in developing countries, but other important host animals are the wolf, mongoose, and bat. Worldwide, the highest risk groups for contracting rabies are boys under the age of fifteen. Most deaths from rabies in the United States result from bat bites. People whose work frequently brings them in contact with animals are also considered to be at higher risk than the general population. This group includes those in the fields of veterinary medicine, animal control, wildlife work, and laboratory work involving live rabies virus. People in these occupations and residents of or travelers to areas where rabies is a widespread problem should consider being immunized. Rabies is caused by a rod- or bullet-shaped virus that belongs to the family Rhabdoviridae. The virus is usually transmitted via an animal bite; however, cases have also been reported in which the virus penetrated the body through infected saliva, moist tissues such as the eyes or lips, a scratch on the skin, or the transplantation of infected tissues. Inhalation of the virus from the air, as might occur in a highly populated bat cave, is also thought to occur. From the bite or other area of penetration, the virus multiplies as it spreads along nerves that travel away from the spinal cord and brain (efferent nerves) and into the salivary glands. The rabies virus may lie dormant in the body for several weeks or months, but rarely much longer, before symptoms appear. Initially, the area around the bite may burn and be painful. Early symptoms may also include a sore throat , low-grade fever, headaches, loss of appetite, nausea and vomiting , and diarrhea . Painful spasms develop in the muscles that control breathing and swallowing. The individual may begin to drool thick saliva and may have dilated or irregular pupils, increased tears and perspiration, and low blood pressure. As the disease progresses, the patient becomes agitated and combative and may exhibit increased mental confusion. The affected person usually becomes sensitive to touch, loud noises, and bright lights. The victim also becomes extremely thirsty but is unable to drink because swallowing is painful. Some patients begin to dread water because of the painful spasms that occur. Other severe symptoms during the later stage of the disease are excessive salivation, dehydration , and loss of muscle tone. Death usually occurs three to 20 days after symptoms have developed. Recovery is very rare. After the onset of symptoms, blood tests and cerebrospinal fluid (CSF) analysis tests will be conducted. CSF will be collected during a procedure called a lumbar puncture in which a needle is used to withdraw a sample of CSF from the area around the spinal cord. The CSF tests do not confirm diagnosis but are useful in ruling out other potential causes for the patient's altered mental state. The two most common diagnostic tests are the fluorescent antibody test and isolation of the rabies virus from an individual's saliva or throat culture . The fluorescent antibody test involves taking a small sample of skin (biopsy) from the back of the neck of the patient. If specific proteins, called antibodies, that are produced only in response to the rabies virus are present, they will bind with the fluorescent dye and become visible. Another diagnostic procedure involves taking a corneal impression in which a swab or slide is pressed lightly against the cornea of the eye to determine whether viral material is present. Because of the extremely serious nature of a rabies infection, the need for rabies immunizations should be carefully considered for anyone who has been bitten by an animal, based on a personal history and results of diagnostic tests. 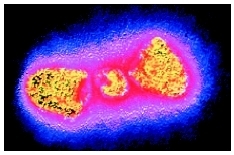 Rabies virus shown in yellow. with a catheter and soapy water. Unless absolutely necessary, a wound should not be sutured. Tetanus toxoid and antibiotics will usually be administered. Rabies vaccination may or not be given, based on the available information. If the individual was bitten by a domestic animal and the animal was captured, the animal will be placed under observation in quarantine for ten days. If the animal does not develop rabies within four to seven days, then no immunizations are required. If the animal is suspected of being rabid, it is killed, and the brain is examined for evidence of rabies infection. In cases involving bites from domestic animals in which the animal is not available for examination, the decision for vaccination is made based on the prevalence of rabies within the region where the bite occurred. If the bite was from a wild animal and the animal was captured, it is generally killed because the incubation period of rabies is unknown in most wild animals. If necessary, the patient is vaccinated immediately, generally through the administration of human rabies immune globulin (HRIG) for passive immunization, followed by human diploid cell vaccine (HDCV) or rabies vaccine adsorbed (RVA) for active immunization. Passive immunization is designed to provide the individual with antibodies from an already immunized individual, while active immunization involves stimulating the individual's own immune system to produce antibodies against the rabies virus. These rabies vaccines are equally effective and carry a lower risk of side effects than some earlier treatments. Unfortunately, however, in underdeveloped countries, these vaccines are usually not available. Antibodies are administered to the patient in a process called passive immunization. To do so, the HRIG vaccine is administered once, at the beginning of treatment. Half of the dose is given around the bite area, and the rest is given in the muscle. Inactivated viral material (antigenic) is then given to stimulate the patient's own immune system to produce antibodies against rabies. For active immunization, either the HDCV or RVA vaccine is given in a series of five injections. Immunizations are typically given on days 1, 3, 7, 14, and 28. In those rare instances in which rabies has progressed beyond the point where immunization would be effective, the patient is given medication to prevent seizures, relieve some of the anxiety , and relieve painful muscle spasms. Pain relievers are also given. In the later stages, aggressive supportive care will be provided to maintain breathing and heart function. Survival is rare but can occur. If preventative treatment is sought promptly, rabies need not be fatal. Immunization is almost always effective if started within two days of the bite. Chance of effectiveness declines, however, the longer vaccination is put off. It is, however, important to start immunizations, even if it has been weeks or months following a suspected rabid animal bite, because the vaccine can be effective even in these cases. If immunizations do not prove effective or are not received, rabies is nearly always fatal within a few days of the onset of symptoms. Active immunization —Treatment that provides immunity by challenging an individual's own immune system to produce antibody against a particular organism. Efferent nerves —Peripheral nerves that carry signals away from the brain and spinal cord. Fluorescent antibody test —A test in which a fluorescent dye is linked to an antibody for diagnostic purposes. Lumbar puncture —A procedure in which the doctor inserts a small needle into the spinal cavity in the lower back to withdraw spinal fluid for testing. Also known as a spinal tap. Passive immunization —Treatment that provides immunity through the transfer of antibodies obtained from an immune individual. Rhabdovirus —A family of viruses named for their rod- or bullet-like shapes. The rabies virus is a rhabdovirus. Vector —A carrier organism (such as a fly or mosquito) which serves to deliver a virus (or other agent of infection) to a host. Also refers to a retrovirus that had been modified and is used to introduce specific genes into the genome of an organism. Zoonosis —Any disease of animals that can be transmitted to humans. Rabies is an example of a zoonosis. Domesticated animals, including household pets, should be vaccinated against rabies. If a pet is bitten by an animal suspected to have rabies, its owner should contact a veterinarian immediately and notify the local animal control authorities. Domestic pets with current vaccinations should be revaccinated immediately; unvaccinated dogs, cats, or ferrets are usually euthanized (killed). Wild animals should not be touched or petted, no matter how friendly they may appear. It is also important not to touch an animal that appears ill or passive or whose behavior seems odd, such as failing to show the normal fear of humans. These are all possible signs of rabies. Many animals, such as raccoons and skunks, are nocturnal and their activity during the day should be regarded as suspicious. People should not interfere in fights between animals. Because rabies is transmitted through saliva, a person should wear rubber gloves when handling a pet that has had an encounter with a wild animal. Garbage or pet food should not be left outside the house or camp site because it may attract wild or stray animals. Windows and doors should be screened. Some victims of rabies have been attacked by infected animals, particularly bats, that entered through unprotected openings. State or county health departments should be consulted for information about the prevalence of rabies in an area. Some areas, such as New York City, have been rabies-free, only to have the disease reintroduced at a later time. Preventative vaccination against rabies should be considered if one's occupation involves frequent contact with wild animals or non-immunized domestic animals. Bites from mice, rats, or squirrels rarely require rabies prevention because these rodents are typically killed by any encounter with a larger, rabid animal, and would, therefore, not be carriers. Travelers should ask about the prevalence of the disease in countries they plan to visit. Parents should speak with their children about the importance of avoiding contact with wild animals and reporting strange behavior in any animal, even a pet. Adams, William G. "Rabies." In Nelson Textbook of Pediatrics. Edited by Richard E. Behrman et al. Philadelphia: Saunders, 2004. Plotkin, Stanley A. "Rabies Virus." In Principles and Practice of Pediatric Infectious Diseases , 2nd ed. Edited by Sarah S. Long et al. St. Louis, MO: Elsevier, 2003. Fooks, A. R., et al. "Risk Factors Associated with Travel to Rabies Endemic Countries." Journal of Applied Microbiology 94 Suppl. (2003): 31S–6S. "Human Rabies—Iowa, 2002." Morbidity and Mortality Weekly Report 52 (January 24, 2003): 47–8. Messenger, S. L., et al. "Emerging Pattern of Rabies Deaths and Increased Viral Infectivity." Emerging Infectious Diseases 9 (February 2003): 151–4. National Association of State Public Health Veterinarians Inc. "Compendium of Animal Rabies Prevention and Control, 2003." Morbidity and Mortality Weekly Report Recommendations and Reports 52 (March 21, 2003): 1–6. Smith, J., et al. "Case Report: Rapid Ante-Mortem Diagnosis of a Human Case of Rabies Imported into the UK from the Philippines." Journal of Medical Virology 69 (January 2003): 150–5. Stringer, C. "Post-Exposure Rabies Vaccination." Nursing Standard 17 (February 5–11, 2003): 41–2. Weiss, R. A. "Cross-Species Infections." Current Topics in Microbiology and Immunology 278 (2003): 47–71. American Veterinary Medical Association (AVMA). 1931 North Meacham Road, Suite 100, Schaumburg, IL 60173–4360. Web site: http://www.avma.org. "Epidemiology [of rabies]." National Center for Infectious Diseases. Available online at http://www.cdc.gov/ncidod/dvrd/rabies/Epidemiology/Epidemiology.htm (accessed January 9, 2005).